Heat oven to 375°F. Separate dough into 8 triangles. Place in ungreased 9-inch square pan or 10-inch pie plate; press in bottom and up sides to form crust. In 10-inch skillet, cook beef over medium heat 8 to 10 minutes, stirring occasionally, until thoroughly cooked; drain. Stir in pizza sauce and bell pepper; simmer 5 minutes. Spoon beef mixture in crust-lined pan; sprinkle with cheese. Top with pepperoni. Bake 14 to 17 minutes or until crust is deep golden brown and cheese is melted. Served topped with basil. Top with additional chopped green pepper or ripe olives for even more flavor. Craving a deep dish-like pizza, but don’t feel like flying all the way to Chicago? You’re in luck, thanks to this super easy crescent roll pizza that’s reminiscent of your favorite Chicago-style pizza. Buttery crescent rolls make quick work of the crust and get pressed into a 9-inch pie plate, and then topped with all the goods: sauce, cheese, pepperoni, veggies and some ground beef. Add fresh basil or oregano if you want even more flavor! This pizza bake is just the beginning. There are so many pizza recipes for you to try next! Never made pizza at home before? Don’t worry. We have every trick in the book for making the best pizza of your life. 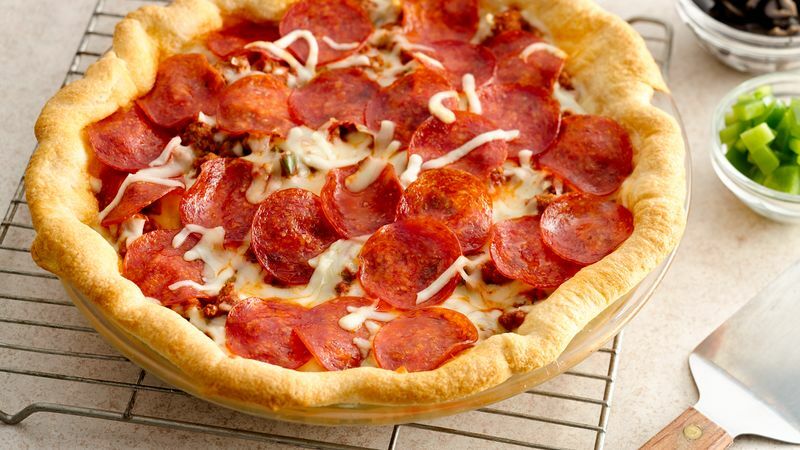 Say goodbye to delivery and hello to homemade pizza goodness.